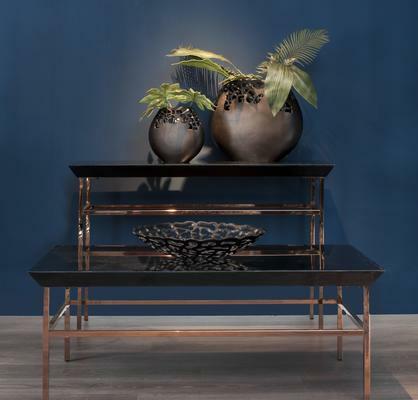 This Celeste Black & Copper Coffee Table is made perfect for any modern or contemporary space. The table features a rectangular design. The frame and support is made from high quality stainless steel with a copper finish. Meanwhile, the top portion is smooth with a glass surface. This makes it very easy to clean. This combination of materials gives the table a very elegant vibe. You can use this inside your living room lounge area or inside your office reception. It would look great when paired with modern furniture pieces as well. The Libra Company was established by Joe and Christine Mclaughlin in 1972 and has been producing some of the most gorgeous furniture, lighting and accessories for the home for over four decades.